RBTH presents a selection of views from leading Russian media, featuring analysis of Kiev’s stalling on ratifying Ukraine’s association agreement with the EU, possible scenarios for the next stage of the military campaign against pro-autonomy militias in the east of the country, and news of firefights near several frontier checkpoints bordering Russia’s Rostov Region. Nezavisimaya Gazeta writes that Ukrainian President Petro Poroshenko is in no hurry to ratify the Association Agreement with the European Union. Ministerial consultations will be held at the Ukraine-Russia-EU level in the near future, at which the negotiators will discuss how the agreement could influence Ukrainian-Russian trade and economic ties. According to the newspaper, European officials and the Kiev government are convinced that there will be no problems. However, the Russian government has warned that it will be forced to impose trade restrictions in order to protect its markets. This is why Poroshenko’s team has stalled in ratifying the agreement at the Verkhovna Rada. “Ukraine is technically ready, but for some reason the president is hesitating,” Nezavisimaya Gazeta writes. Last November, potential damage to the national economy resulting from the loss of Russian markets was one of the key reasons behind the decision taken by Viktor Yanukovych and Mykola Azarov to postpone signing of the EU agreement. Now, the newspaper reports, in light of public sentiment, the new president is unable to put it off any longer, though he is in no hurry to ratify it. Nezavisimaya Gazeta’s experts think that discontent with the new government is on the rise. “In contrast with the events of 2004, Ukrainians do not perceive the president as an omniscient tsar, but merely as an employed manager, and they view the West as an advisor and reliable partner, and as the sole instrument by which to pressure authority,” the newspaper writes. Gazeta.ru writes that Kiev is preparing to blockade Donetsk and Lugansk, while the pro-autonomy militias are preparing to reinforce them. Kiev’s latest military successes – the capture of Slavyansk and surrounding cities – have narrowed the ring of the anti-terrorist operation. The militias in Donetsk have been unable to create a vertical military and political power structure, and a large number of fragmented armed groups are at work in the regions. At the same time, Gazeta.ru writes that there will be no swift assault on the city; not because the Ukrainian armed forces lack capabilities, but because it could lead to a large number of casualties. “This would allow Russia to accuse Ukraine of a humanitarian catastrophe and change the West’s attitude towards the problem,” Gazeta.ru reports. This is precisely why Kiev is trying to push the rebel cities into submission: block the border, set up block posts, and sever supply lines. Neither side, each for its own reasons, is interested in forcing a sharp campaign, and without any major changes the situation could drag on indefinitely, Gazeta.ru writes. “Ironically, armed conflict is a common trump card in the hands of both Kiev, supported by the western countries, and Moscow. Either side could use it to pressure the other,” the publication writes. The outcome of the military conflict will depend on completely peaceful negotiations and on the status of the rebel regions, Gazeta.ru argues. Vzglyad writes that fighting is under way in Ukraine near Russia’s Donetsk checkpoint in the Rostov region, and workers at the customs post have been evacuated. “The shooting on the other side is not subsiding,” Vzglyad writes. There have been frequent incidents and provocations on the Russian-Ukrainian border lately; for example, on Tuesday, July 8 a mine exploded in the Rostov Region during a clash, and 13 different types of shells have exploded since the start of the fighting in neighboring regions. 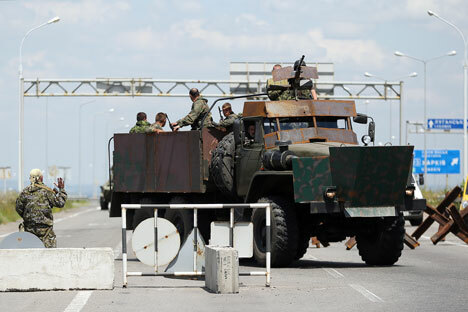 As a result, three checkpoints on the border with Ukraine in the Rostov Region were temporarily closed due to fighting. According to Vzglyad, Russia’s Novoshakhtinsk checkpoint in the Rostov Region came under mortar fire from the Ukrainian side, and the Gukovo checkpoint was hit by ammunition issuing from Ukrainian armed forces.